Mid-September marks the start of a packed fall season of major book releases. 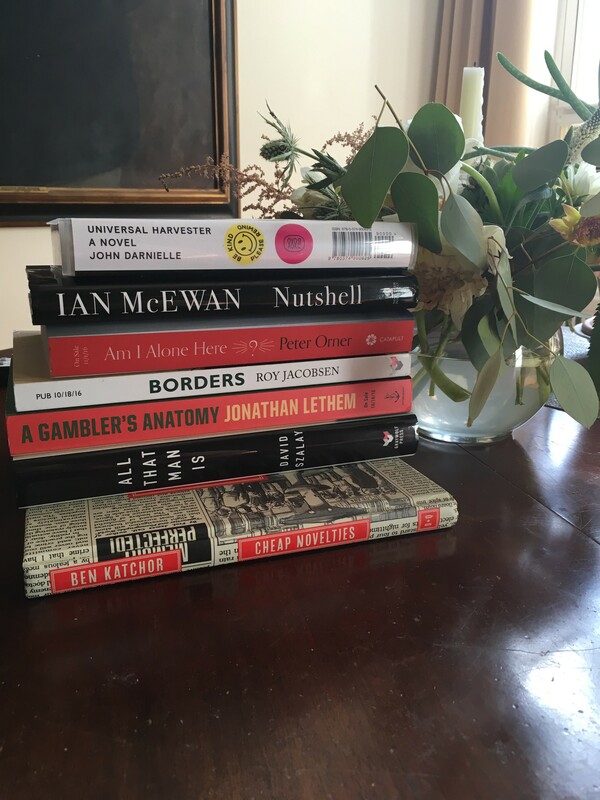 Many great writers like Ian McEwan, Jonathan Lethem, Zadie Smith, and Michael Chabon have books coming out this autumn; those of you try to keep up on contemporary literature will have to save a little money and free up some shelf-space. Here’s a look at my current stack of books to read and review. I’m currently reading Nutshell and Borders, both of which are really good (Nutshell surprisingly so). Borders is literary-classic material and I fear that it might be overlooked by readers on account of its heavy subject matter (The Ardennes region in World War II). Reviews of both should be online in the next week or so. Also excited to check out Szalay’s All That Man Is in anticipation of the Booker Prize announcement next month.